Lori and I had little doubt that our children would walk with the Lord when they got older. Perhaps most Christian parents feel this way, or perhaps it’s just a sense that comes from relying on God’s promise that if you “train up a child in the way he should go: and when he is old, he will not depart from it” (Proverbs 22:6). Yes, we understood by watching other children of godly parents depart from the faith, that for some reason, there are children raised in wonderful Christian families who choose the foolish things of this world over a relationship with their Creator God for eternity. But for me and my house we were bound and determined to follow the Lord without wavering or doubt. Recently we had a few terrific days with three of our precious grandchildren and when they are with us, we find ourselves doing with them many of the things that we did with our own children. Their mom just had number four, a beautiful and precious baby girl, so grandparents to the rescue. We stepped in and took the kids into our home. The truth be told, these kids do more for us by way of joy, fun, and enjoyment than we do for them. I can remember a few tears they shed, but most of the time was fun, games, and laughter. So what is this training that we are to impart to our children and grandchildren that once they know the way to go they will not depart from it? Here are just a few ideas that we have done to raise four godly offspring who all walk faithfully and joyfully with their Lord. Perhaps it will give some of you a spark of ideas to add to your training tools as you embrace God’s promise fully that your children will walk faithfully with our God. The top of our list for training is joyfulness. There is nothing worse than a bunch of crabby, crying, or difficult kids in a home. Very little training can be accomplished when a child is not receptive to joy but instead focused on selfish, fleshly things. Make sure the kids are fed well, get lots of sleep, and have no obvious reasons to be unhappy. Children by nature are generally very joyful and fun-loving, at least until they hit their teens, but if they are not, don’t put up with it. That’s right. We have a “grumpy” chair, (or the fireplace mantel when our children were young), where we just said the word and the grumpy child would run to the chair and sit on it until they are ready to return and choose to be joyful. Insisting on joyfulness is not as hard as you might think, but it does take the discipline of consistency to train a child that if they are going to be in a bad mood, they need to have the grumpy mood away from the rest of us who don’t want to be dragged down by it. It is amazing what a couple trips to the grumpy chair can do so that all you have to do is ask, “Do you need to go to the complaining chair?” and the child breaks out in the most fake smile ever, yet they turn their mood around quickly. Too many adults today could have used the moody chair when they were younger to train their emotions so that they learned to control them, instead of being controlled by them. 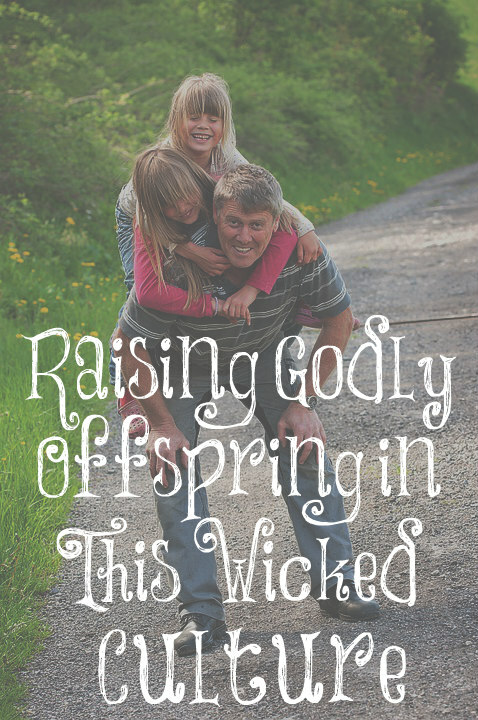 Making a joyful noise in our home often means singing or squealing with laughter. I grew up in a home filled with Christian music as my godly mom was always singing. She had the prettiest voice that filled the home and it seemed that for each and every trouble we had she would break out into a hymn or song that would capture the answer to what we needed to hear. Who needs a lecture when Mom can sing you to right thinking and straighten out your mood with her joyfulness? In our home, there are lots of fun things we do together. Just out of the blue it seems a child will be whacked with a pillow by Papa and the pillow fight is on. Three kids all attacking Papa as he punches back with a huge pillow on each hand. At other times, Papa hears grandma teaching the kids the song, “The B-I-B-L-E, yes that’s the book for me…” and he comes down to this harmonious chorus to grab a hold of the littlest one and dance with her. Then the march begins and we march step-by-step around the rooms singing the song as loudly as we can! Lori was always great with getting our children playing outside during the day. She now opens the garage door and pulls up a lawn chair and the kids play in the front yard. The next thing you know the other kids come running out of their homes and electric cars, scooters, and bikes are running everywhere. This can last an hour or two as other moms and dads join in. Getting our kids outside and exercising was very important to us as our kids played a lot of organized sports or danced ballet. But we feel there are few things better than going on long, regular walks with the children where great conversations take place. I am still smiling inside thinking about our walk last evening with our grand kids. We got to the park and I told Lori to keep going our normal way and we would meet her after our detour. We went dashing down the grassy hills with other moms smiling and laughing at us. Our four-year-old grandson panting away holding his side saying, “Hold up guys!” and Papa responding, “No we have to go over the edge” as we flew over the small embankment with my precious cargo in the stroller howling with laughter. Then they insisted on running all the way home together, feet flying as fast a little three and five-year-old can go while Papa pushed an empty stroller. It is not by accident that the next morning two of the kids said, “I slept really hard last night.” Children need lots of outdoor exercise in order for them to be physically healthy . When they rise and when they go to bed teach them God’s amazing promises and miracles. I am amazed how eager our grandkids are to go to bed at night. Seven o’clock rolls around and one was asking, “Is it bed time?” Then two others come over to my chair and say, “Papa, think of a story to tell us tonight!” Off to brush teeth then they all three hop in bed hiding under the covers. Papa comes in with a loud roar as he jumps on the bed and tickles them all. Then, it is story time. “Give me an age,” I say, and they pick the age of seven. “Once upon a time a long, long, long, long, long long time ago when Papa was only seven years old …” out comes a story from my wonderful childhood growing up on an island in the Caribbean. Almost every story makes a spiritual point or draws a spiritual conclusion. Sometimes, I am asking the kids not to do what Papa did, or encouraging them to do the right things, and other times I am telling them about my love for Jesus at such a very young age. Stories about miracles that have happened in my life and the hard times of growing up with an angry brother who lost his arm in an accident, yet he came back to the Lord in his 20’s to be a missionary to France. So much spiritual training can be learned from what a parent did right or wrong, showing our children that we, too, make mistakes, but the blood of Jesus can cover us and make us whole again. The most precious stories are of the times when all seemed hopeless, yet God intervened to give His miracles. Give them the gift of Discipline. If you could give just one gift to your children, it would be to teach them early in life, by age one or two, that “No” means “NO.” Teaching discipline early in life will be a gift that keeps giving at every aspect of life; College, Marriage, Career, the Law and all Relationships. Far too many parents confuse their children because “no” often means, “unless you keep nagging me and then I say yes.” What a disaster some parents have taught their children with their inconsistency and then wonder why their children end up texting and driving, drinking at parties, and getting sent to the principal’s office, all because they never learned that “no” means “No way.” Once this lesson is learned by 2-3 years old, life with children is so much easier. It does not mean we never change our minds, or you won’t find a child playing the two parents’ decisions against each other. But a home will be far more joy-filled when our children know the boundaries and choose to live within them. Love God and serve Him. Treat others the way you would like to be treated. Such simple ideals that allow a young mind to focus on what is most important in life. If we love God, we will do what is right by keeping his wonderful commandments. And the second greatest commandment of all is to love your neighbor as yourself. In doing these things, you must always strive to be the best you can be, because it is not the smartest, or the best looking, or the one with the best personality in life that has the greatest success, but the one who is willing to keep trying to be the best they can be by outworking and out loving others. Don’t be afraid to show you are human and make mistakes. Yes, we made some mistakes along the way. Things we regret and would not do the same way again. The goal is not to be a perfect parent as that will just get you second guessing yourself all the time. The Christian life should never be spent second guessing but by reaching out and grabbing a hold of all of God’s promises, even those that are hard to believe. We train up our children in the way they should go and they will not depart from God’s ways that we have helped instill into them. But to do this, we had daily time in the Word with our children and Lori faithfully took the kids each Wednesday evening to AWANA where they hid God’s Word in their hearts by memorization. Shine Jesus to your children no matter what your troubles. I am convinced that nothing was a more powerful source of training for our children than for them to see our joy in Lord as we lived life prayerfully, joyfully, and playfully most of the time. Whatever marriage troubles we had were hidden from our children as we did not want our sins and bad habits to become theirs. No, we were bound and determined to train these precious gifts God had given us in His ways and with His joy. If you want to grow up kids quickly who understand what life is all about, show them how you handle personal sickness and troubles by keeping God and his promises first and foremost in your life. We praise God that by His grace four families have spun off from the Alexanders who are all walking faithfully with our God. Our hearts are full of joy and running over, but as Lori’s Dad reminds us, “It’s not over yet.” So we keep them all in our prayers daily knowing that God is always good and true to His promises. And when we feel He is not? We must trust that He still is good and He has our children in His loving hands. And you shall teach them your children, speaking of them when thou sit in your house, and when thou walk by the way, when you lie down, and when you rise up. Are You Like Sarah’s Daughter or Lot’s Daughter? Beautiful advice!!! My parents raised me similarly, to be grateful, joyful, and most importantly WANT to be a good person and care about more than superficial things like materialism! Their trick was to let me have autonomy and explore and learn the lessons for myself. If they had only told me what to do 100% and never let me choose to have my own opinions, acknowledged and validated me feelings, and let me learn from my mistakes all while guiding and mentoring me, I would have turned out to be just another selfish entitled young person! They made me want to be an upright person, and they gained my respect, not by threats and merely so I could avoid a consequence, but because THEY set the example of righteousness for me to follow and surrounded me with people I could intrinsically respect. I think much of the entitlement comes from parents who only cater to their every whim, and never tell them they are rude/wrong/mistaken in any aspect as we all are at times simply as human beings! The participation trophies take away any sense of true earning and merit, so they get used to only superficial hollow victories. They thus feel entitled to everything without having to work for anything! Another huge quality to raise in your children is resilience and persistence/determination. So many that I’ve seen throughout my school years have been fragile, and you can see it now in college campuses! The trigger warnings, the “microaggressions” being offended over every tiny thing when past generations endured far far worse hardship! In addition, many were coddled academically by school and their parents, and micromanaged so when they have to “parent” themselves so to speak they can’t and act like immature children! I’ve personally witnessed many of my college peers flunking out 1st semester, medically withdrawing for the sniffles, sleeping in past their classes, even skipping them “just because” all while their parents foot the bill! They cared nothing for the sacrifice and privilege that got them there! They were just used to the schools passing them along, and parents catering to them, never letting them stand on their own two feet! it has always been hard raising children, but it’s harder now in our fallen society of entitlement, selfishness and instant gratification which led to countless problems today like hook up and divorce culture for starters! Thanks! It seems we are on the same page together. Good thoughts. This is by far my favorite Ken post I’ve ever read in the many years of reading this blog. Very encouraging and informative. I’m going to print this out! Thanks Shelly :). I hope you are doing great. This is a great post, Ken. I pray that the people who read it are encouraged that they can also do this, too. It is hard work and parents must be determined. Satan wants the next generation to live for him, not Jesus, so our focus in parenting really must be eternal. God bless! Amen! Our only desire is to see Christian families retake their rightful place as lights in a dark world. That marriages and Christian children would be something that does not follow along with the slippery slope of society but stands strong on God’s Word. God has given us all we need in His Word to be the ideal User’s manual for mankind. Now if we will only open it up and read it for ourselves and believe it, we can change the world by advancing the Kingdom of God. What a wonderful, wonderful post. It’s all about love. When my children were born, I felt as if the light of God had leapt into my heart. Nothing about them was less than perfection. Just walking down the street and watching them explore the world made my heart almost stop with joy. I’ve never stopped feeling that way. Now they are ready for college and I can only hope to get more of their time. My own parents were fun but lost interest in us kids when we were teenagers. They divorced and ran off to have fun, leaving us to fend for ourselves. Yet they still claim to love us. I never believed another word they said. Now as a parent, I can’t imagine doing that to my children. There is nowhere on earth I’d rather be than listening to them and being with them. I am so sorry to hear about how your parents seemed to be distracted from their roles as parents but so happy to hear that you have chosen to do just the opposite. It always amazes me how a child can have both an awesome childhood and choose not to invest in their children, or another have seemingly unloving or distracted parents yet turn the other way to love greatly their own children. Choice is a powerful determinant for life to chose to sin, or to overcome sin by faith in the cross and power of Christ. This is probably the best post on here I’ve read in a long time. So much of what is written here is about simply loving and enjoying our children and having fun with them. So, so important! Thanks KAK! Raising children well is at the heart of our lives and ministry. Hence why Lori is so focused on leading Christian women to godly Biblical Womanhood. Both of my sons are young adults now and are in the stage of questioning their faith. I listen to their concerns and am grateful that we have been able to keep a dialogue going even though I am very distressed about this inside. I remind myself that I too had a time of questioning my childhood faith and rebellion against my mother’s teaching. Both of my sons are well-behaved, thoughtful, kind, hard working, excellent students, and so far have avoided many of the pitfalls and poor choices I made at the same age. I keep praying protection over them and we keep the conversation going. I have been honest about my own past struggles and desire for them to stay on a better path, and encourage them to realize that faith can make them stronger, better men and fathers and enrich the lives of generations to come. Praying for you and your sons, Kande! Rest in God’s promises Kande! There are many your Christians who seem to take a detour from the faith yet the Lord brings them back like the prodigal son. I hate secular colleges and universities as they lead so many of our kids astray with doubts just when they are ready to affirm a full faith in Christ. I hope it was not college profs that have placed the doubts in their minds. Get them books “A Case for Faith,” and “A Case for Christ,” and ask them to please read them. Saying a prayer for you and your family. Very encouraging and challenging! Thank you, Ken and Lori. No discipline system in the world does any good without a context of love. Thanks for emphasizing this context in your post. What’s AWANA though? I’ve seen it pop up in various christian posts, but I have no clue what that is. Is it something american? I see! Thanks for answering! Maybe we don’t have that in Europe… My parents helped my brother and me memorize bible verses when we were younger. That was good too, though AWANA sounds fun! Thank you! I love this! I was raised in a godly home, but my brother still has rejected God in his adulthood. Not only does it break my heart, it breaks my parents’ hearts to see their son not walking in the Lord’s paths. My ONE desire is to see my eight children choosing God for their adult (and children) lives. Thank you for sharing, Mr. Alexander. It was a blessing to read this post. So encouraging! Thank you! We truly need all these possible words. It’s been very rough for my family lately. We changed our whole life for Jesus! We really stand out in our town. I don’t meet too many people that speak this kind of love and truth! Thank you so much! I am 20 years old and I care from a home where my parents were married but my father was emotionally abusive and my mother was sick although she is as healthy as anyone else now praise the Lord! To hear this experience of raising up children in the love of God warms my heart and I can only hope that if being a mother is what God has called for my life that I am able to steer away from what I was raised in and lean into creating a home and space for joy to be overflowing and Christ to be the head and exemplified. I don’t have all of the tools and in this changing world, family life isn’t talked about as much as it should be since the home is the foundation of a person but I hope that I am able to tell the tales of overwhelming love and closeness in my own home one day. Bless your family Ken and Lori! !